While looking at the different sizes of refrigerators available these days, I noticed that there are some really large fridge freezers on the market. These large size refrigerators are great for comfortably storing extra food but not so great if space in your home is limited. A refrigerator is a must have appliance for every home, therefore finding a good quality compact size fridge freezer will be essential for small kitchens. One downside of small compact refrigerators is that they can be cramped for storage space, especially if they are used by more than two people. Tall and narrow fridge freezers are a solution to this problem if your kitchen has some free above counter level space. If there isn’t any free space above counter level, then you may have to choose one of the counter depth refrigerators. In this article, the Best Fridge Freezers For Small Spaces, we will be reviewing the best compact, narrow refrigerators suitable for small kitchens. With these reviews, hopefully you will be able to decide which type of compact fridge freezer will be best for your kitchen. First of all, this fridge freezer by Danby is very highly rated on Amazon with over 1,000 reviews. Secondly, there are several sizes to choose from, ranging from 1.7 cubic feet to 4.4 cubic feet, therefore there should be a compact size refrigerator suitable for any small kitchen. Finally, there are Danby All-Refrigerators to choose from that do not have a freezer section, and there are Fridge Freezer combos to choose from that have a small freezer section at the top. Instead of reviewing all the different sizes, I will be discussing the 4.4 cubic feet fridge freezer. The overall dimensions of this fridge are 20.9” W x 20.7” D x 32.7” H. It also has a mini freezer on top (if you choose this model), however with all small refrigerator freezer combos, the mini freezer ices up pretty easily. If you decide to take an all refrigerator, then you get extra space and no defrosting issues. Overall, it is a highly rated refrigerator and because it comes in a few different sizes, it will be ideal for dorm rooms, small offices, small studio apartments and as an under counter depth refrigerator. There is a choice of 1.7 / 2.6 / 3.2 / 4.4 cubic feet refrigerator options available. The 4.4 cubic feet fridge freezer has got some good storage space. The main compartment has 2 ½ glass shelves, that can be adjusted to suit the size of the products. There is a space for tall bottles and one really neat feature is the 8 soda can storage compartments on the inside of the door. As stated above, the freezer is very small but is full width. It would be suitable for making ice, however judging by the reviews, the vast majority of people bought the refrigerator without the freezer because these mini freezers ice things up too much. This fridge freezer is energy star rated, which means it uses less power to run and will be a good money saver in the long term. Another nice feature is that it comes with a convenient reversible door hinge for both left and right-handed opening. 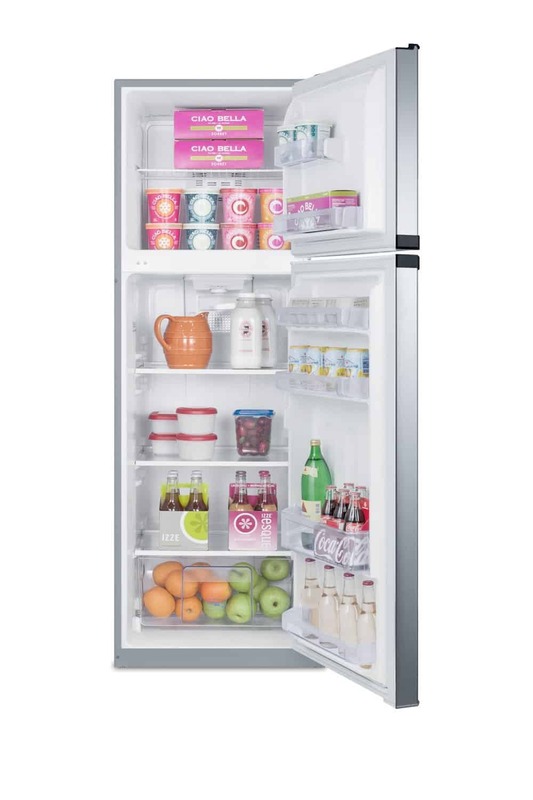 Overall, this fridge freezer by Danby is an excellent buy, at an affordable price. The majority of customers have bought the all-refrigerator due to the fact that the mini freezers are never the best with these fridge freezer combos. If you want to make some ice in your refrigerator then one of these freezers will be fine, however to store food, then maybe a separate freezer would be a better option. If you are looking for a fridge freezer or an all-refrigerator of various sizes for your small office, small apartment, bedroom or small kitchen, then we can definitely recommend one of these highly rated units by Danby. This two door refrigerator freezer combo by Costway is a really nice little appliance and would be ideal for small kitchens. We really like the separate freezer compartment because separate compartment freezers always perform better. The unit is 3.2 cubic feet and measures 19” W x 19.5” D x 31” H, making it ideal for under the counter placement. The refrigerator itself is 2.2 cubic feet, while the freezer is a decent 1 cubic feet. The fridge compartment has a bottom veggie basket and two glass shelves. The inside of the door has a tall bottle shelf and a nice soda can holder for six cans. It can be difficult to judge how spacious a freezer is just by looking at photos, however two customers confirmed that the freezer was large enough to hold a gallon of ice cream, 5 large pizzas and two large bags of french fries. Therefore, the 1 cubic foot freezer is quite spacious. The fridge runs smoothly and very quietly. It is not frost free, however it doesn’t pick up frost quickly. The easy to access controls to set the temperature are in the main compartment. Overall, a very affordable, high quality two door fridge freezer combo that will be ideal for small kitchens, dorm rooms and small offices. We really like the separate compartments for the fridge and freezer and both compartments are quite spacious. 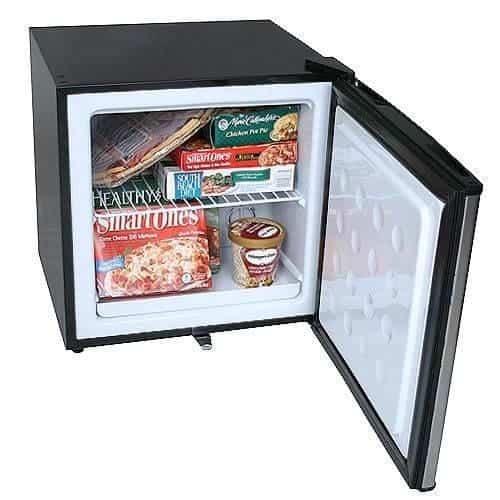 Whether you are looking for a compact refrigerator or a small size freezer for your small kitchen dorm, bedroom or office, this little unit could be what you are looking for. It easily converts from a cooling temperature to 0°, depending on what you want to use it for. This versatile little fridge or freezer is a really handy appliance to have. The unit has 1.1 cubic feet capacity and measures 19.25″ H x 18.5″ W x 17.75″ D. As you can see by the dimensions, it is a really small size refrigerator and will only be suitable for one person. However, for what it is, we really like it and believe it is an ideal appliance for small dorm rooms and bedrooms that have no access or little access to kitchens. Due to the fact that this unit can be converted into a freezer, it is also ideal for kitchens that want a separate little freezer to accompany their refrigerator. It is a small fridge/freezer, so don’t expect to fit large amounts of items into it. However, it definitely works well and will be ideal for one person. There is one shelf in the middle of the compartment and doesn’t have any storage area on the inside of the door. Whether you want to use this as a refrigerator or freezer, it is easy to change the settings from 0°, all the way up to 40°. The door is reversible, therefore suitable for left or right opening. It also comes with a lock and two keys, making it ideal for people sharing rooms but not sharing the refrigerator. It is also more energy efficient than their previous models, with an estimated yearly operating cost for this model of under $25. I really love this model and it is one of my favorites in these reviews. I love the versatility of the unit because it easily allows you to use it as a refrigerator or a freezer, just by changing the settings on the thermostat. Its compact mini size makes it ideal for small spaces and the lock is another nice feature to keep your food safe when sharing rooms. If you are looking for a very small fridge or freezer, then this 1.1 cubic feet little unit by EdgeStar is our strong recommendation. 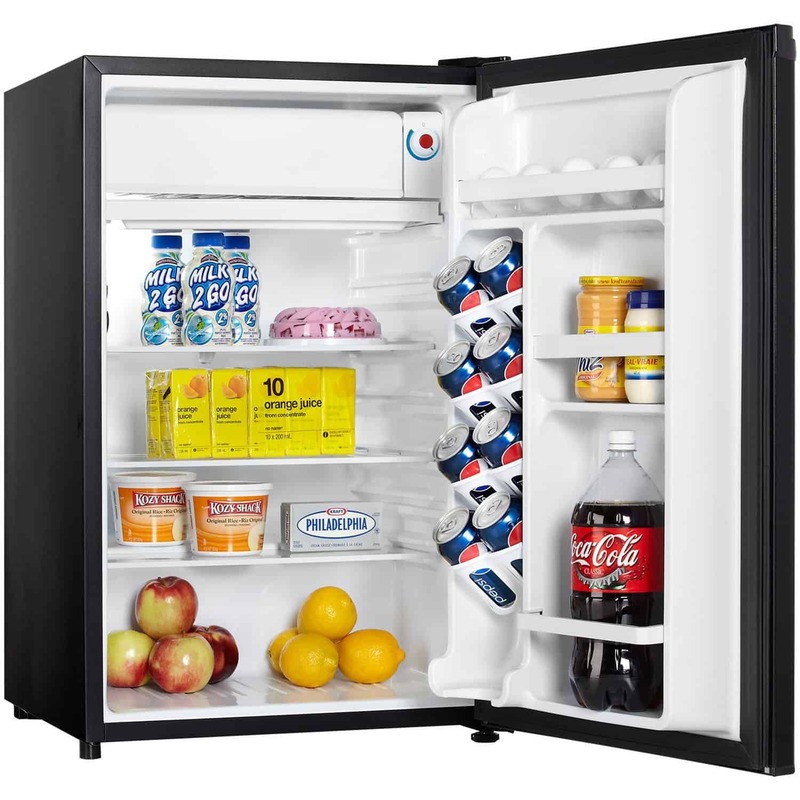 This budget price mini fridge by Haier, is a great choice for small offices and dorm rooms. It is great for one person or for keeping the basics cold for a number of people. It also has a small little section for freezing, which will be useful for making ice. It measures 17.9” W x 19.4” H x 18.9” D and 1.7 cubic feet. This compact mini fridge is ideal for private rooms like bedrooms and dorm rooms, where you don’t want hungry hands stealing your food. It also would be a nice addition for a small office, and along with a mini dishwasher, wouldn’t take up too much space but are very convenient. The refrigerator has one full width slide-out wire shelf that will section off small items on top and medium size items at the bottom. 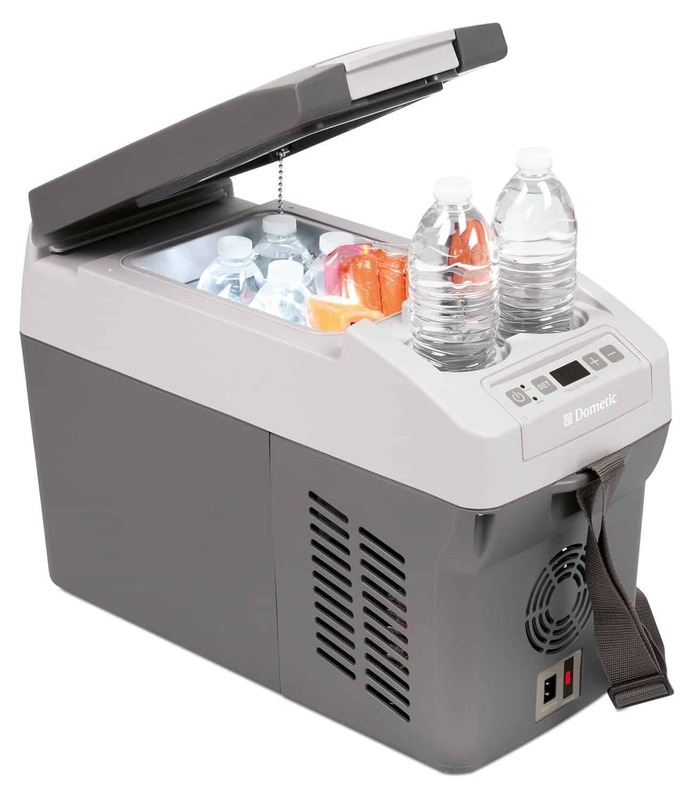 There is also a half-width freezer compartment with an ice cube tray at the top, that is ideal for making ice or for storing small frozen items. The inside door has two storage sections: one full-width section and one half-width section. The full-width section is large enough to hold a 2 liter bottle of soda and the half-width section will store smaller items, like yogurts. The adjustable thermostat allows you to control the temperature of the refrigerator. If you would prefer to use this fridge as a freezer, then it is possible to set the thermometer to freeze the whole compartment. Overall, this small size fridge freezer is excellent value for the price. It is great for one person or for keeping basic items like yoghurts, milk and sodas, cool and fresh. The mini freezer compartment is great for making ice or for keeping mini tubs of ice-cream solid. This compact little refrigerator by Haier is a great bargain buy. This medium size freezer by Midea, is a great choice for people that want a freezer only. It is counter depth and quite spacious. It is also highly rated on Amazon, with several hundred positive customer reviews. The freezer measures 21.3” W x 19.7” D x 33.9” H and 3.0 cubic feet. It is small enough not to take up too much space, however large enough to have some good storage. 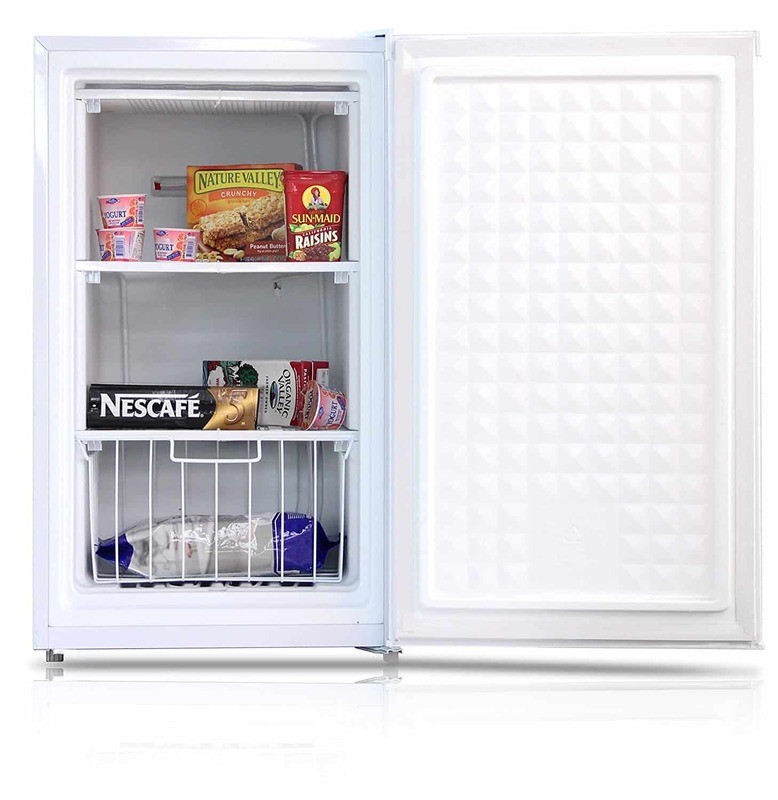 If freezing goods are more important than refrigerating them, then this medium size freezer will be an ideal choice. The freezer is surprisingly spacious and can hold quite a lot of food. The interior contains two shelves (which are non-adjustable) and one basket. The two shelves each provide space measuring 14.5″ W x 9″ H x 13″ D and the basket provides space measuring 13″ W x 8.5″ H x 8″ D. The shelves cannot be removed, however the basket can. There are no extra storage shelves on the door, however there is plenty of space in the freezer compartment. The door is reversible and can be opened from left or right. It is also energy star rated, using an estimated 240kWh electricity yearly: electricity use – roughly 29$ per year. This freezer by Midea is not so big yet not so small. It is spacious on the inside, runs very quietly and will be ideal for small homes and small businesses that need some extra storage space for frozen goods. It is also energy efficient and sold at a decent price. Sometimes you may need a fridge freezer to take travelling, for camping trips or for picnics. If you want to keep food frozen when it is hot outside, then this mini size portable fridge freezer will be a perfect choice. With 10.5 capacity liters and measuring only 21.3” L x 14.1” H x 9.2” W, this portable fridge freezer is one of the smallest on the market. Weighing less than 20 lbs, it is ideal for carrying around and fitting into small spaces. If this size is too small then there are several sizes to choose from (10.5, 23, 31, 37, 49, 80 or 106 capacity liters). 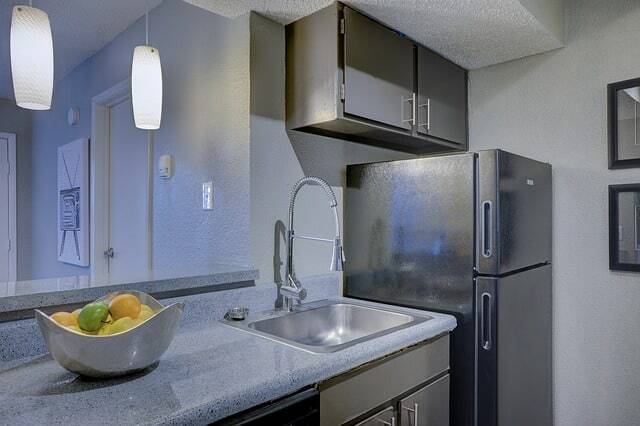 As you can see in the image below, the storage potential of this mini fridge is quite small. It has the capacity to hold 6 x 12 ounce cans. If this storage capacity is not enough, then you might consider one of the larger ones. The exterior is made of high-impact polyethylene and is durable and weather resistant. It has electronic thermostat LED controls with soft touch buttons and also comes with a 12/24 Volt DC cable cord. There are cheaper thermo-electric coolers available, however they haven’t the capacity to keep things cool when in a heated environment (for example, the inside of a vehicle). It is not cheap but a very good quality product and highly rated on Amazon. We know that living in a dorm room can be cramped and difficult to find enough room to fit all the essentials in such a tight space. 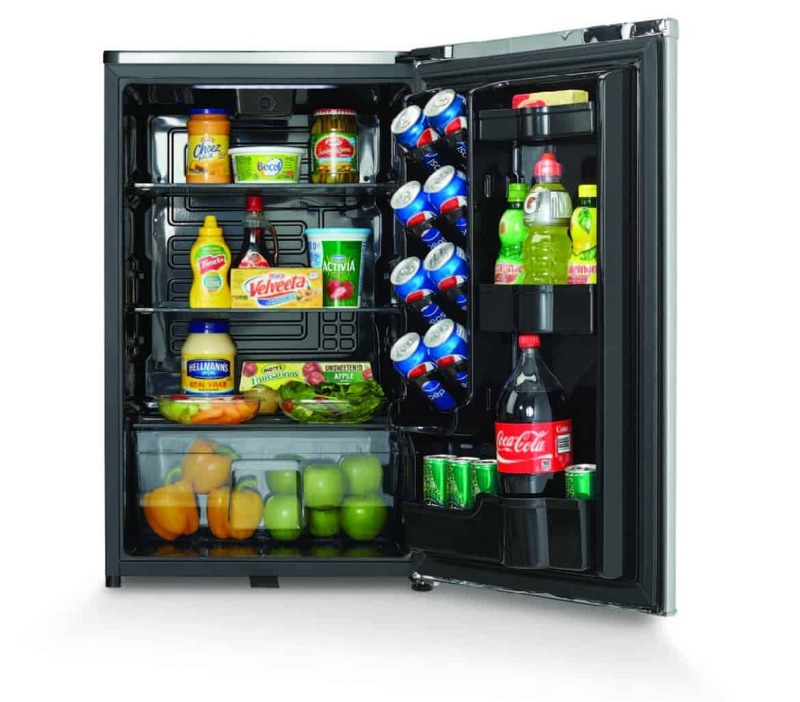 A refrigerator and freezer is one of these essentials and this one by EdgeStar is an ideal choice for dorm room living. 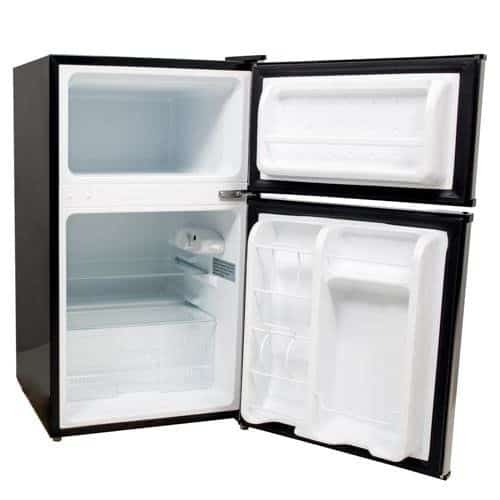 The overall dimensions of this fridge freezer are 33.5″ H x 18.75″ W x 19.75″ D. It is small in size but not too small. 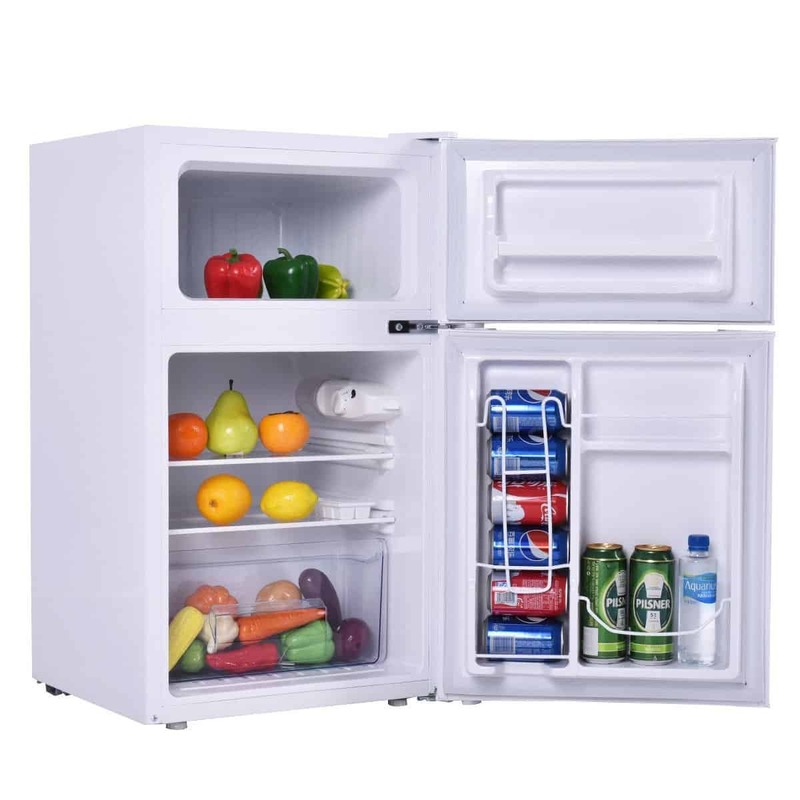 This little fridge freezer is suitable for dorm rooms, small offices and other small rooms. The freezer alone measures 7 7/8″ H x 14″ W x 14.75″ D which is not large, however it will be great for making ice and keeping smaller items frozen. 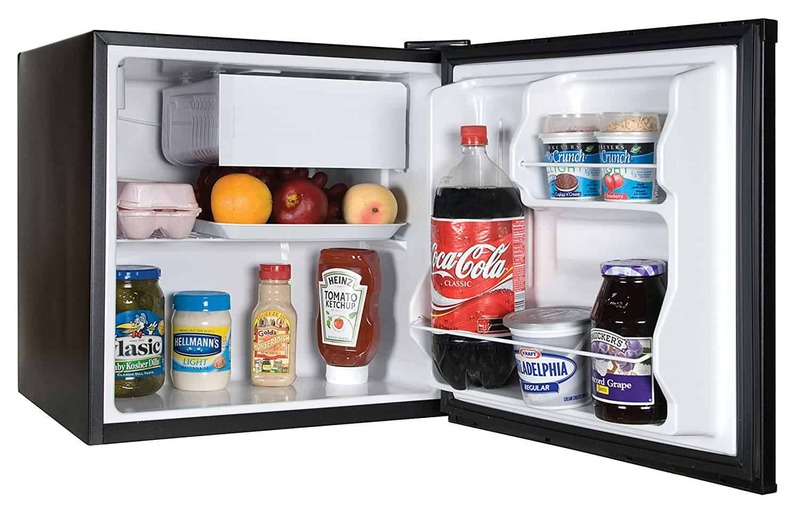 The refrigerator measures 18 5/8″ H x 15.5″ W x 14.5″ D and has some decent storage space. The refrigerator has two removable glass shelves and a large veggie basket. The fridge and the freezer both have side sections for storing stuff. The fridge is capable of storing tall bottles, soda cans and other smaller items. The refrigerator has an automatic defrost feature however the freezer has to be defrosted manually. The fridge has a light when the door opens and is energy star rated, therefore won’t eat up too much power. This compact fridge freezer by EdgeStar is perfect for small dorm rooms and any small room in general. We like that it has separate freezer and fridge doors and the good storage space it has inside. If you are looking for an affordable 3.1 cubic feet capacity fridge freezer for your dorm room or small office, then this one is a good choice. I really like this popular, attractive refrigerator by Danby, not only for how it looks, but also for its price and features. I love the black interior which is so different to any I have seen before. It will be ideal for dorm rooms and shared rooms because of its locking feature and will be suitable for any small kitchen because of the choice of sizes and colors available. This compact refrigerator is available in 1.7, 2.6, 3.3 or 4.4 cubic feet sizes. The images in this review are of the 4.4 cubic feet fridge and is perfect for counter height. Its overall dimensions are 21.3” D x 20.8” W x 33.1” H and weighs 65 lbs. This one is the largest of the compact sizes and is an ideal choice for small kitchens. It is an all-refrigerator and has some decent storage space due to having no freezer. The first thing you will notice, is the striking black interior, which is quite unusual. It has 2 ½ tempered glass shelves for decent storage of various sizes. The fridge also has a plastic veggie basket at the bottom. The door interior also has some good storage space including a section for a tall bottle, 8 separate spaces for soda cans, and some half sections for small to medium sized items. It is an Energy Star compliant and environmentally friendly refrigerator, has reversible door hinges to suit your kitchen and also has an automatic defrosting feature. Also, the exterior looks fantastic with its scratch resistant worktop, retro-inspired curved door design, metallic door finish and rubber-grip ergonomic chrome handle. To top it off, there is a door lock to keep your food safe from prying hands, if needed. Overall, this is a high quality, highly rated refrigerator by Danby, that looks awesome and performs very well. If you are looking for a compact All-Refrigerator without a freezer, then we highly recommend this option. Perfect for kitchens with limited space, this tall and slim fridge freezer by Summit won’t take up too much space but will offer extra storage space compared to the medium size refrigerator. This family size fridge freezer will look great in small kitchens. Overall dimensions are 26” D x 22” W x 65” H and weighs 155 lbs. With its 22 “ width, it is very similar to the small refrigerators, however because it is so tall at 65”, it has a capacity of 8.8 cubic feet and offers so much more storage space. It really is a perfect space saver for for small, cramped kitchens. The refrigerator has 3 adjustable shelves and a large tilt-out crisper. Additionally, inside the fridge door there are three other shelves (the middle shelf is capable of storing tall bottles). The freezer has one removable wire-shelf and two shelves on the inside door. The 8.8 cubic feet is more of a family size unit, compared to the compact fridge freezers. The beauty of this tall fridge freezer is its height because it offers so much more storage space without taking up any more ground space. The frost free feature prevents ice build up and the stainless steel doors and platinum cabinet give a classy, clean appearance. We always talk about using height in small spaces to take advantage of upper space. Well, this tall and slim fridge freezer is a perfect example. It takes up the same amount of ground space as a compact fridge freezer but provides far more storage space. Ideal for small homes or small offices that need extra storage space for more people. A refrigerator is one of the most important appliances in any kitchen. It keeps food fresh and frozen, therefore it is important to choose wisely when investing in one. Fridge freezers come in all different sizes and budgets, so it is best to ask yourself some questions before you settle on your perfect refrigerator. Firstly, how much space is available in your kitchen. If you have a small kitchen, then you can’t have too large a refrigerator. There are very large fridge freezers available these days and they seem to be getting larger every year. A small kitchen needs a compact size refrigerator or a ‘tall and narrow’ one. Remember to measure the area you plan to fit the refrigerator to make sure it has the correct dimensions. Secondly, what are your shopping habits and how many people will use it. If you have a large family and you buy a large amount of groceries at once, then a small fridge may not be suitable for your storage needs. However, if you live alone and you make trips to the shops quite regularly for smaller amounts of groceries, then a mini size refrigerator may be all you need. Thirdly, do you already have a freezer. If you already have a separate freezer in your kitchen, then you might be wasting refrigeration space by getting a fridge freezer combo. There are refrigerator only, freezer only and fridge freezer combos to choose from, so make sure you know which one you will need before making your final decision. Next, what size fridge freezer do you need. The size of the fridge freezer you need will depend on many factors and one of them is where you will place the fridge. Choose the size of the fridge freezer depending on where you will place it. Under counter fridges will slot under a counter, tall fridge freezers will need both lower and upper space, where as a mini fridge might fit on top of a counter or if it is for a dorm room, then next to a bed. Finally, the budget. Size and quality will influence the price of the fridge freezer, however you would expect to have the same fridge freezer for several years, therefore it is best to invest wisely in a good quality appliance. Finding the right size fridge freezer for small spaces can take a little effort, however with the variety of shapes and sizes available, it has never been easier. Whether you want a mini fridge for your dorm room, a medium size refrigerator for your small apartment or a tall and slim fridge freezer for your small kitchen, there are affordable and high quality ones to choose from. If you would like to have a look at some compact washing machines, make sure to check out this article. 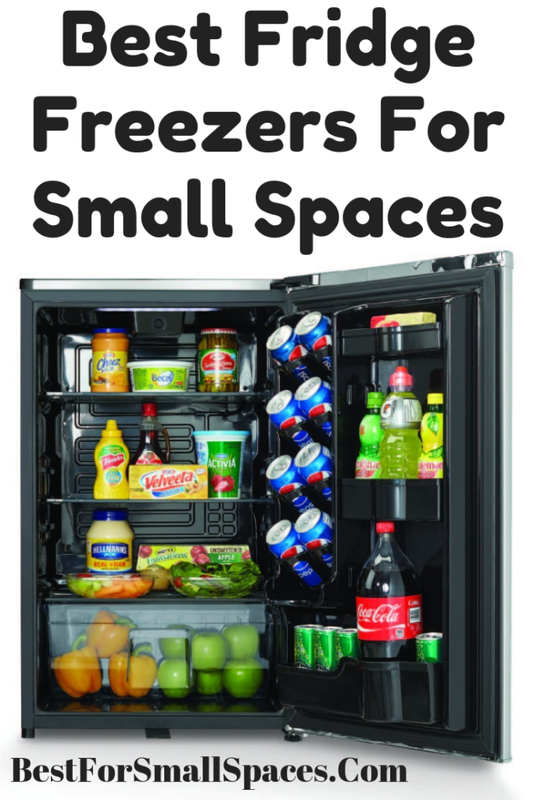 We hope you found this article on the Best Fridge Freezers For Small Spaces 2019 helpful and we hope you were able to find the perfect size fridge freezer for your small place.